I left Geneva late on Thursday afternoon as the train to Lausanne only takes about 45 minutes but costs around 23 CHF which is $32, Urgh. Most of these trains tend to be 2 stories and most people automatically hate bmac and her backpack. Seriously though people, I packed my life in to a 70l Katmandu Bag and a carry on so don’t mess with me! After 5 weeks on the road I finally figured out that wheeling my backpack and slinging my carry on over my shoulder (like a backpack) works wonders. It might have taken me awhile, but hey, Rome wasn’t built in a day. I stayed at the Lausanne Guesthouse which is conveniently located to the main train station. I walked about a kilometre with my luggage, and there was a small hill to conquer. Oh the joy! The hostel was clean enough but I found $52 for a bunk bed with no breakfast included pretty pricey. On Friday morning I made my way to the Olympic Museum, a must do when visiting Lausanne! It’s a beautiful museum with a wealth of history, information and interactive exhibits. I found it really interesting to learn about how the Olympic Games first started and they have every Olympic Torch on display. It’s a sports lovers dream and I would highly recommend a visit. I walked back to the hostel along the beautiful Lake Geneva and stopped off at the grocery store to buy ingredients for a sandwich. The two things in Switzerland that are affordable, chocolate and cheese! So I had a brie and ham sandwich an a swiss chocolate bar. Rather delicious. In the afternoon I found a faster way to the train station and headed for Zurich. I stayed at the Youth Hostel Zurich and it was a very clean hostel with lovely and helpful staff. I stayed in a four bed female dorm and was really surprised to be sharing it with 3 German women aged between 45-60. So hip of them! I’ve heard on my travels that it’s quite common for Europeans to stay in Hostels, even with their families. I spent Saturday exploring the Old Town. I walked the five kilometers in to the city centre along Lake Zurich. It was such a beautiful walk, the sun was shining and the temperature was almost a little too hot (about 15 degrees!). There were plenty people out and about enjoying the sunshine and having picnics. 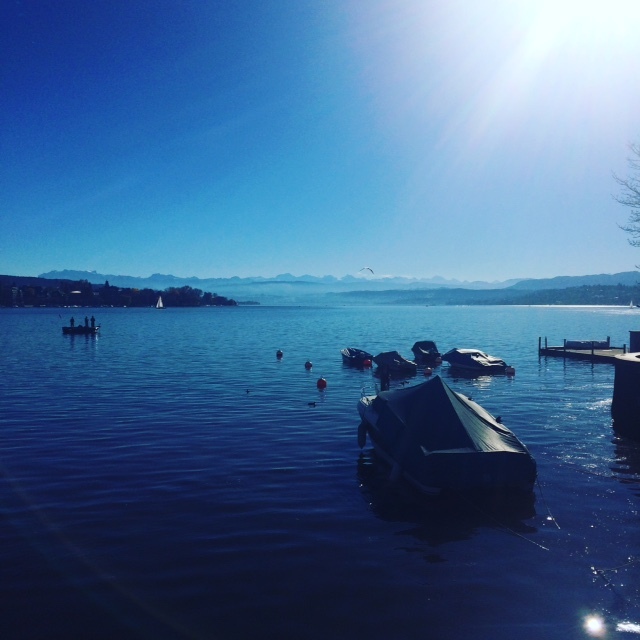 It was easy to see why Zurich is often voted one of the best places to live in the world. After wandering around the city for hours, I decided to take a tram back to the Hostel and have a social Saturday night. Due to the older and family focused crowd, I wasn’t really meeting people and decided I needed to get out. I did some research and decided on the Zurich Pub Crawl. It was 20 CHF to go on this pub crawl and it included 4 free drinks. A great deal considering most drinks will cost you 20 franc each, or between 30-40 for a cocktail. I kid you not, you are looking at about $30 minimum for a ONE DRINK. There were about 20 of us and a really interesting mix of people. There was a young doctor who had just moved to the city, some American exchange students, local professionals and me, the token Australian. I’ve found the people I’ve met along the way LOVE Australian accents and will often as me a lot of questions just to hear it. Luckily I like to talk! A few of the guys decided they were hilarious when they came up with the nickname Aussie-Brit due to my name, and dual passport. It was a great night and I’m glad I decided to go out. My ‘original friends’. These lovely locals asked me if I was looking for the pub crawl when I was wandering around lost in the middle of the city! Sunday was pretty quiet and the hostel staff assured me it was 15 minutes by train to the airport so I thought I had everything sorted. I purchased my train ticket, and doubled checked google maps on the way to get there. Maps was saying it was at least 50 minutes to get there. HOLD THE PHONE. I was flying to Amsterdam so it’s an international flight and I was cutting it way too fine. Cue a slight panic, ordering an Uber, and then googling the information to see if I had misheard the staff. Nope, their website says 15 minutes. Absolutely not possible. The Uber cost me $70 but as one of my friends said, cheaper than a new flight. I was relieved that I made it on time, only to almost miss the plane again! As I scanned my boarding pass to enter the plane, it wasn’t working. I asked the airline staff and they are like “It’s not working because you are flying Swiss, this isn’t a Swiss flight.” Oh god.. The same thing had happened to some others as the flight codes were similar, and the planes were departing for Amsterdam 5 minutes apart. I had less than 5 minutes to run 20 gates. What a sight it would have been! I made the plane, and then we had to wait on the tarmac for almost an hour. But at least I got some free chocolate and a nap. I will certainly take more care in planning airport trips in the future! After a somewhat chaotic afternoon and a week in the land of neutrality, It was time to say good-bye to the incredibly beautiful but incredibly expensive Switzerland and the weirdly abbreviated Swiss Franc and hello to Amsterdam; the city of bikes, legalised marijuana, the infamous red light district, beautiful canals and the Euro! Disclaimer, I did not indulge in the green stuff. Mum and Dad, a reward for good behaviour in the form of travel donations are always welcome ;). Loved the post, Britt! I’ve been to Lucerne so I understand what you mean when you write about the beauty of Switzerland. And your airport near-disaster reminds me of our Ryanair debacle in Santorini. Our hotel guy told us we were organising to get to the airport way too early but even then it wasn’t enough time to deal with the ridiculous Ryanair systems! I met a pilot last night who used to fly for Ryanair and he is like ‘don’t ever fly them!’ Haha. Well I’m now sharing with a guy in his late 60s. You’re not old at all! ← Switzerland, a worthy opponent to the $25 pie!